LR Barcodes allows detecting and decoding barcodes from photos. 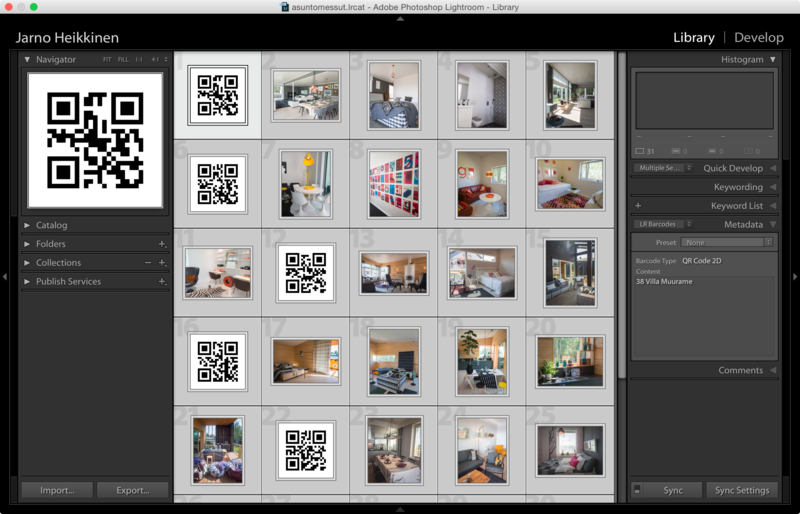 Now you can easily apply the barcode data for multiple photos inside your Lightroom catalog. Supported barcodes include e.g. EAN, UPC, ITF (I25), Code 39, Code 128 and QR Code. This is plugin is still work-in-progress. if you have comments or suggestions for workflow, either leave a comment to mail to support@capturemonkey.com. Version 0.2.1319 Added option to propagate metadata fields into keywords under LRBarcodes keyword. Fix Windows decoder that did not start if the plugin was on different drive than Lightroom. Version 0.2.1270 Mac OS X build did not work on older than 10.9. Fixed, now works from 10.7 onwards. Version 0.2.1234 QR Code now defaults to UTF-8 decoding, not SJIS. Version v0.2.1213 replaced Java ZXing decoder with ZBar decoder library. The new version no longer uses Java, so it should be much easier to setup. In my testing, ZBar is also detecting less false negatives (barcodes that go undetected) than ZXing. Additionally, the plugin no longer uses Lightroom rendered previews, but it uses the image files directly. While previews should have been a good solution, there were far too many problems with Lightroom not writing the files to the disk etc. On Windows, RAW photos are not yet supported. On Mac, RAW support is provided by OS X, so all most common RAW photos should be supported. 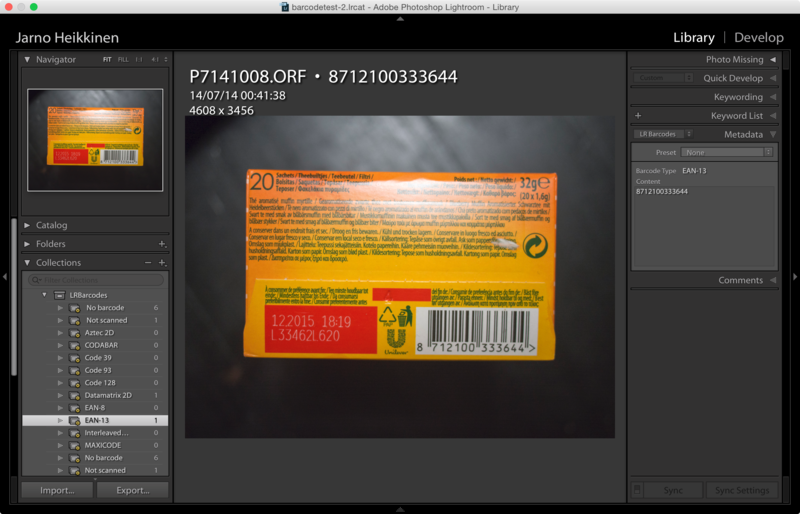 Unzip the package under your home folder, go to Lightroom Plug-in Manager, click Add and select LRBarcodes.lrplugin. The plugin will add new metadata fields to your Lightroom catalog for barcode type and content. Optionally, it will also create smart collections to filter detected barcode types. Running the detection pass will take some time, it is scanning all selected photos for barcodes. Barcode type and content are then written to catalog, so they can be used for filtering and metadata work. The real secret sauce in this plugin is the metadata propagation functionality. This allows you to select a range of photos and to copy values from chosen field to adjacent photos. For basic product shoot, just shoot the barcode first and then the product. 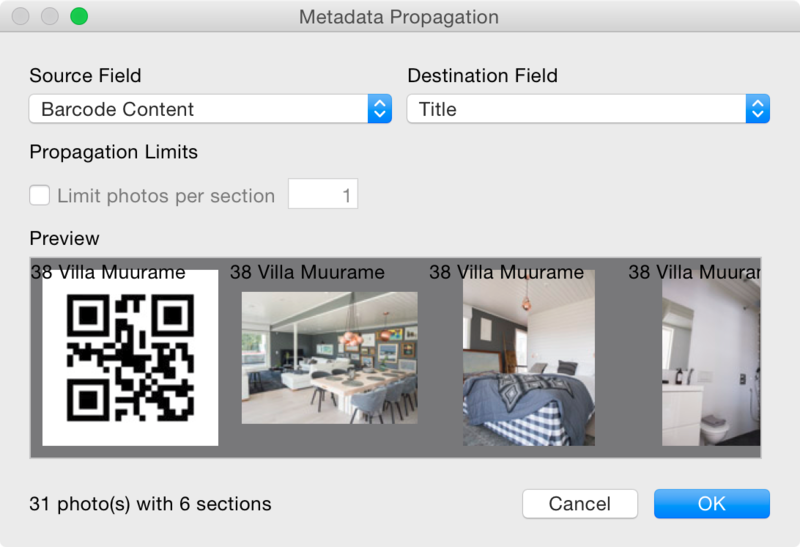 Select photos, open metadata propagation tool to copy the barcode content into e.g. caption field, so that you can use it in export later on. Every time a non-empty value is detected in the chosen source field, it is set as the current destination value and copied to following photos. Finally, you can filter product shots by barcode type “Not Found” to hide the barcodes from your shots.